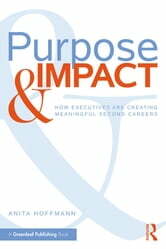 Purpose & Impact is the first book aiming to provide guidance to senior executives and professionals for how to rethink and even relaunch careers that align with wider purpose and societal impact. With our increasing longevity, the concept of retirement is becoming redundant, as executives need, financially, and want, motivationally, to continue to work well beyond what is currently considered ‘retirement age’. Around age 50, when we often leave our mainstream employers, we could be looking forward to around 30 healthy years, equivalent to a whole second career. This book, therefore, sets out a topic that is becoming increasingly important and urgent for governments, companies and executives alike. This book is underpinned by research (including interviews with over 90 senior executives) conducted by the author. Many of their stories are interspersed throughout the book to provide the reader with real insight into how very diverse senior executives and professionals created roles that enabled their own personal growth and development and had positive impacts on wider society. In addition, helpful tools and guides are used throughout the book to help the reader in their decision-making processes through the different stages of discovering and developing themselves and their career goals.